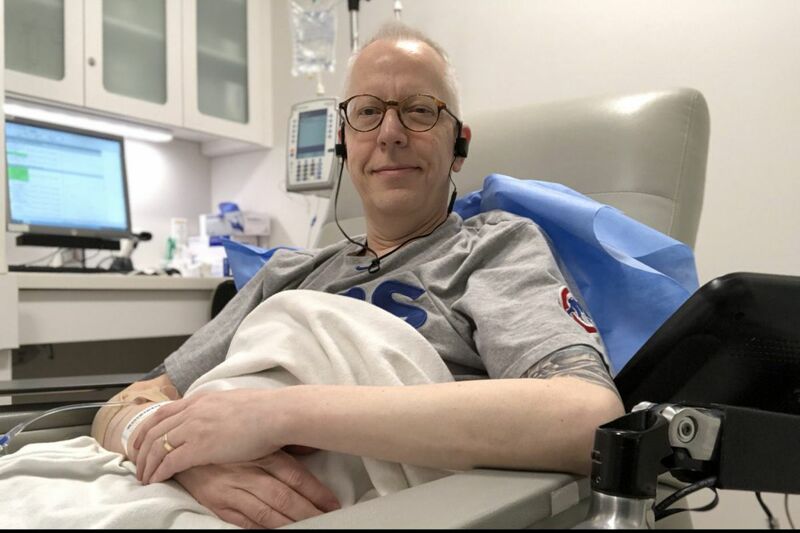 With chemotherapy keeping his incurable oral cancer in check, Michael Becker has become a vocal critic of “right to try” laws. As he holds his own against terminal neck cancer, Michael Becker can relate to those who want to make experimental drugs more available to people with fatal illnesses. Even so, the former biotech executive is a vocal critic of "right to try" laws that aim to expand access by eliminating the U.S. Food and Drug Administration's oversight of the process. Becker watched with sadness on Tuesday as the U.S. House passed a federal right-to-try bill that he believes could be a "disaster" for patients like him. The measure passed the Senate last August and is now headed for the signature of President Trump, who championed it. "I took it very hard," Becker said from his Yardley home. "I watched C-Span. The Republicans were talking about this legislation like it's the best thing since sliced bread. They completely misrepresented it." To be sure, Becker, 49, would love to have what right-to-try proponents imply the law will offer: access to a cure. He wants a full lifetime with his wife and two daughters, not to mention more time for his activism. He works to raise awareness of the HPV vaccine, an underused pediatric shot that could have prevented his cancer — if it had existed when he was a kid. In hope of beating oropharyngeal cancer, Becker researched clinical trials after the disease recurred in December 2016, barely a year after initial treatment. He qualified for a clinical trial of an immune-boosting drug at the National Institutes of Health. Clinical trials — the human testing that the FDA requires to assess safety and effectiveness — are the primary route for patients to get access to experimental medicines. "The immunotherapy didn't eradicate my disease, but my response to subsequent chemotherapy has been beyond expectations. Maybe the immunotherapy helped boost my response to chemo," said Becker, whose lung and spleen tumors shrank. "So I'm here longer than I expected." Although he longs for a miracle, Becker is a realist who, thanks to a career in biotechnology, understands the drug development process. As he has written, patients already have the right to ask companies for "compassionate access" to experimental therapies. The U.S. Food and Drug Administration approves 99 percent of the compassionate access applications it receives — about 1,000 a year — after manufacturers say yes. The problem is, manufacturers often say no — and could still do so under "right to try." The reasons are many. Companies may be struggling financially. Or not have enough of the drug. Or fear that if a patient is harmed, damaging publicity will follow. Becker believes right-to-try advocates have downplayed the issue of potential harm. In addition to cutting the FDA out of the compassionate access process, the new federal law would absolve manufacturers, prescribers, dispensers, insurers, and any "other individual entity" from liability for problems, including deaths. The FDA would be restricted in how it could use information about harms in deciding whether to approve a drug. "Do patients undergoing right-to-try therapies lose their coverage for hospice? " Becker wondered in a recent article for STAT. "What if the experimental drug causes hospitalization or leads to additional treatments — who would pay for that?​"
Over the last five years, right-to-try laws have been passed in 40 states, including Pennsylvania but not New Jersey. Behind this juggernaut is the Goldwater Institute, a Phoenix-based libertarian think tank. After the House vote, Goldwater president Victor Riches said, "Millions of Americans who have been told they are out of options … are closer to having the opportunity for one last treatment, without having to get permission from the federal government first." Yet there is no evidence that existing state laws have expanded access. Becker’s concerns are shared by leading medical, consumer, and pharmaceutical groups. Several hundred critics sent a letter to House leaders expressing “strong opposition” to the federal bill, which Trump urged Congress to pass in his State of the Union speech. The White House issued a statement on Tuesday saying Trump "is happy to deliver on that promise." Becker, meanwhile, fears further erosion of drug safety regulation. The Goldwater Institute has a new campaign that would let manufacturers promote approved drugs to treat conditions for which they were not approved. While the FDA gives doctors discretion to prescribe in this "off-label" way, companies can be fined for marketing drugs for unapproved uses. "You can see the next step," Becker said.